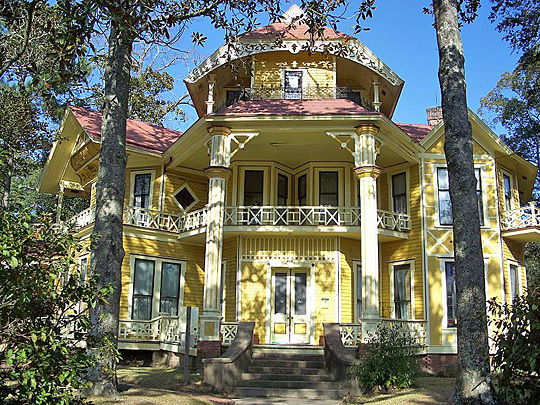 Photo: Lapham-Patterson House, 626 N. Dawson St., Thomasville GA; built between 1884-85 as a winter cottage for businessman C.W. Lapham of Chicago. There are at least 50 exits. Mr. Lapham had been in the Great Chicago Fire and subsequently became paranoid about being trapped in a burning building. Photographed by user: Ebyabe, 2010, (own work) [cc-by-2.5 (http://creativecommons.org/licenses/by/2.5)], via Wikimedia Commons, accessed September, 2012. .
Georgia, founded in 1732, is one of the original 13 states. It was named in honor of England's King George II. Georgia is the largest state east of the Mississippi; the state's large size and thriving industries have given it one of its nicknames, the Empire State of the South. During the Civil War, the fall of Atlanta was a crucial turning point in the defeat of the South. Today, Atlanta, which became Georgia's capital in 1868, is a thriving city with major national corporations, and it is considered the economic and cultural center of the Southeast. The natural beauty and famous seaside resorts of Georgia are a major attraction for tourists. Many beautiful monuments and parks, including reminders of important Civil War battles and heroes, dot the Georgia countryside.